Villa Celine is a pleasant 2 bedroom villa just a short drive from a much-loved Corralejo resort centre. There is a good number of shops, bars, restaurants and a sandy beach. If you don't want to fully rely on a hire car there is a mini market and restaurant within 10 minutes' walk. Back at the villa, the private swimming pool is great for chilling out, whilst the interiors are light and airy. Air conditioning/heating in the bedrooms, pool heating and WiFi are included. 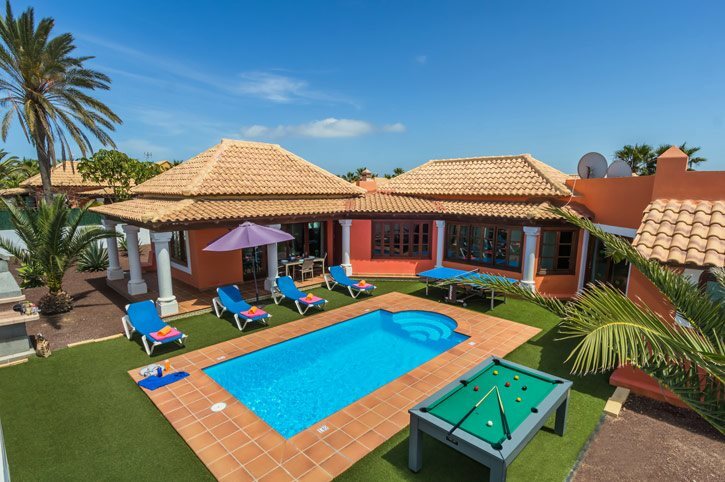 Just a short drive from the lively Corralejo centre and delightful exteriors - Villa Celine has the best of both worlds! The villa is located in a private, gated community of houses. There is gated parking for your hire car. The large wooden front door leads to the lounge/dining area. The open plan lounge/dining area has traditional style furnishings and a wooden ceiling gives a country feel to this room. The lounge has 2 comfy cream sofas and a flat screen TV. On the opposite side there is a table with chairs and a compact but fully equipped kitchen with all the modern appliances. The patio doors lead out to the pool terrace where there is another dining table located. The twin bedroom is beautifully decorated in pastel colours, with separate bathroom next door. Country style furnishings bring a pleasant ambience to the second room which is a double bedroom with an en suite bathroom. Again, very spacious and beautifully decorated in pastel colours. Villa Celine is located in the suburbs of Corralejo. This villa is a short walk from a restaurant and shop, and a few minutes' drive to the lively resort centre, which has a sandy beach. There is also a great choice of cafes, bars, shops and restaurants. This villa makes an ideal choice for those seeking a relaxing break with the resort amenities still close to hand. Villas Alba Mar, Duna Mar and Brisas Mar are along the same street. There is a mini market 10 minutes' walk away from the villa. Many more shops can be found in the heart of Corralejo. The 2 main shopping centres - Las Palmeras and El Campanario - both have a good number of high street named shops and supermarkets. There is a local market on Tuesdays and Fridays - great for bargains! It's best to get there early as it gets very popular. There is a restaurant 10 minutes' walk away from the villa with a much bigger choice of bars and places to eat in the resort centre of Corralejo. You can enjoy lunch at one of the tapas bars, which have typical local food from the island. Or, by night enjoy the live music venues and eateries near Waikiki Beach with the views out to the ocean. The resort of Corralejo has several golden and white sandy beaches where the water is crystal clear. The closest beach to Villa Celine is Waikiki Beach in the resort centre just a short drive away. Conveniently there is a large restaurant located on this beach. The stunning beach of Grandes Playas, which is famous amongst windsurfers, is less than 10 minutes' drive away from the villa. Have a splashing time at Acua Waterpark in Corralejo - one of the most popular theme parks and attractions in Fuerteventura. The park has numerous slides, kids play area and pools. There is also a crazy golf course and bowling alley. From horse riding and go karting to sand sculpting or a visit to Oasis Park Zoo, a holiday in Corralejo offers great family days out. Enjoy a day trip on the express ferry which takes you from Corralejo to Playa Blanca in South Lanzarote. Enjoy the fascinating volcanically moulded landscapes of this Canary Island. If you fancy a game of golf, Mirador de Lobos Golf Resort in Corralejo is located close to the villa. If you prefer a larger course, there are other golf courses to be enjoyed in Caleta de Fuste located on the East Coast just after the airport. You can try the go karting track in Puerto del Rosario. Smaller karts are also available for children. Hiking tours are arranged by the local council and full information can be found in the tourist office in Corralejo. Villa Celine is not available to book for season as it is sold out. Take a look here at the Fuerteventura villas that are currently on sale. A trip to the Island of Lobos will give you access to a beautiful sandy beach which has a gentle slope into the water, ideal for bathing, and there are plenty of fish to be seen if you fancy snorkelling. Could not fault the villa or holiday.